When Shell subsidiary East Resources filled out a permit to drill for natural gas on the Guindon farm in Union Township, it had to answer a series of questions. Would this natural gas well penetrate a coal seam? No, Shell answered. Would it be drilled where coal had once been removed? No. Would the well be drilled within 100 feet of a body of water or wetland? No. Within 200 feet of an existing building? No. A water supply? No. A private water well? Shell listed four of them within 1,000 feet of its proposed well pad. Seeing no problems, the Pennsylvania Department of Environmental Protection approved the permit on June 17, 2010. Part 2: How many wells dot Pennsylvania, and why aren’t we plugging more of them? Two years later, almost to the day, it was something state regulators don’t ask about on the permit application that came back to cause problems at the Guindon well. A 30-foot geyser of water and natural gas erupted out of the ground. Methane bubbled from nearby streams; the water well of a nearby cabin overflowed; and Shell asked the few people living in the area to temporarily evacuate their homes. What happened? The drilling operation got too close to an old gas well, drilled in 1932. The modern-day well likely shook loose methane gas deep underground. That gas then rushed to the surface through the clear pathway created by the 80-year-old well. A geyser of methane and gas sprays out of the ground near a Shell drilling site in Tioga County. StateImpact Pennsylvania obtained this picture from a nearby landowner. The old well – known as the “Butters well” because it was drilled on property owned by Mr. W.J. Butters – is one of an estimated 200,000 abandoned oil and gas wells dotting Pennsylvania. While nobody knows where the vast majority of those wells are, the Butters well was not one of the hidden holes: Shell knew the well was there. A spokeswoman says the company thought the operation had been properly plugged. Clearly, it wasn’t. Click here and here for more detailed StateImpact Pennsylvania reports on what happened in Union Township this summer. As Shell’s summer geyser demonstrated, drilling near abandoned wells can be dangerous. 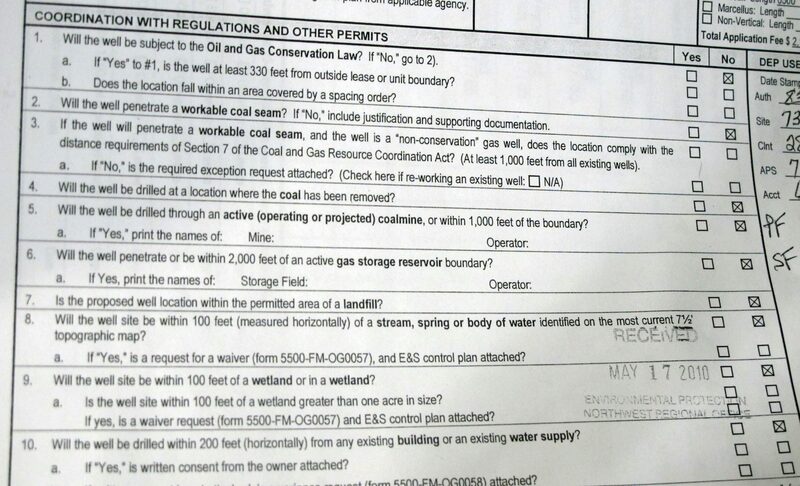 Yet for all the things Pennsylvania requires companies to survey before they drill – there are a dozen items on the checklist – abandoned wells are not one of them. No Pennsylvania laws or regulations bar energy companies from drilling within a certain distance of an unplugged well. Additionally, drillers aren’t required to search for or plug abandoned wells within a certain radius of their site. Pennsylvania isn’t alone in this omission. A number of other states, including Texas, Oklahoma and West Virginia, have both an abandoned well problem at the same time that they’re seeing a shale drilling boom. Of those states, only Ohio considers the presence of these dangerous pathways when deciding whether or not to approve a permit. Essentially, most of the states are leaving the question of how to handle abandoned wells up to the drilling companies. The drillers do have reason to make efforts to identify and plug these wells. They’re financially and legally responsible for damage created when their drilling sites intersect with old wells. Additionally, a problem at a well generates negative press for a company – and loses money. Shell had to burn off months’ worth of natural gas at its Tioga County sites in order to keep pressure down below the ground while it worked to plug the Butters well. As the incident in Tioga County shows, however, sometimes new wells come into contact with old wells anyway. One of the best indications of how a state’s oil and gas drilling regulations stack up against its counterparts is a peer review process called “STRONGER.” The acronym stands for State Review of Oil and Natural Gas Environmental Regulations. STRONGER is governed by a board representing state regulators, the energy industry, and environmental groups. States voluntarily submit their drilling regulations to the board for analysis and review. Texas does require injection well operators to search for unplugged, abandoned wells within a quarter mile – and at times a half-mile – from their proposed sites. Injection wells are used to dispose of fracking fluid and other liquid waste deep underground. They’ve been linked to minor earthquakes in recent years. West Virginia: The state bars drilling within a certain distance of water wells, buildings or springs, but places no restriction on drilling near the state’s 13,000 known abandoned wells. [/module] Pennsylvania has done this four times, most recently in 2010. And while the review team concluded Pennsylvania’s drilling oversight was “well-managed, professional and meeting its program objectives,” it took issue with Pennsylvania’s lack of regulations regarding drilling near abandoned wells. The STRONGER review focused on wells’ potential to serve as a pathway for drilling fluids, not methane gas. Still, it suggested including information about the abandoned sites in permit applications. Pennsylvania has overhauled its drilling standards twice since STRONGER returned its opinion. A set of regulations that went into effect in February 2011 requires drillers to use top-grade cement and steel casing in their wells, in order to help eliminate methane gas leaks. But the rules do not address the issue of abandoned wells, which provide a much more direct pathway for gas to reach the surface. A year later, Governor Tom Corbett signed a law updating Pennsylvania’s Oil and Gas Act for the first time in nearly three decades. Act 13 imposed a host of substantial changes. For example, wells can’t be located within 300 feet of streams, or within 1,000 feet of “water supply extraction point[s].” The law did not follow up on STRONGER’s recommendation about drilling near abandoned wells. It may take a while for the regulation to be finalized, though. Three different state panels — the Oil and Gas Technical Advisory Board, Environmental Quality Board, and Independent Regulatory Review Commission — need to weigh in on the language, and public comment must be solicited. By the time the process plays itself out, it could be early 2014. Part 2: How many wells dot Pennsylvania, and why aren’t we plug­ging more of them?